Histogram: What is it? | Stop Shooting Auto! I confess… I’ve been neglecting Stop Shooting Auto! for a while. I’ve been traveling constantly for the last couple of months, and that plus a full-time job has kept me quite busy. In fact, I’m writing this while sitting at SFO while I wait for my delayed flight to take off. I promised I’d address the histogram next, so let’s do it. Maybe you’ve seen something that looks like this, either in Photoshop or other image editing software, or on your camera when you reviewed an image. Maybe you even took a guess at what it is and how it works, and if you did you probably guessed right. That’s the histogram. Histogram is a scary, technical-sounding word, but it’s actually a really simple concept. The histogram is just a graph of how many dark and light pixels there are in your image. At the far left you’ll see how many dark pixels there are, then moving to the right you’d see count of lighter and lighter pixels until the far right was pure white pixels. In the histogram above, you can see that there are a very few solid black pixels, lots that are a little bit darker than average, a bunch that are a little lighter than average, and a chunk that are pure white. Let’s look at the image and see what it looks like. There are a few pure black or very close to black pixels, mostly around the trash can and along the left wall– that’s the tiny hump on the far left. 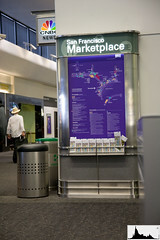 The pure white pixels are mostly on the sign, in particular the words “San Francisco Marketplace” are pure white, and a tiny bit overexposed. That’s the vertical bar right along the far right edge. The dark of the sign, the dark carpet, and the dark part of the wall are the peak on the left. The peak on the right is the lighter part of the walls. Most histograms that you will see don’t take color into account, only brightness. That means that a very bright blue will look just like a very bright white. Some cameras have the ability to do histograms with the colors separate, and of course most postprocessing software can do so as well. This one is kind of fun. Without seeing the image, what can you tell me about it? Obviously you can’t tell me what it’s a picture of, but can you make any guesses about what the image looks like? Is it light or dark? Does it have lots of different shades or only a few? Are there any pure black or pure white areas in the image? Do you think this image is well-exposed, underexposed, or overexposed? OK, they’re calling my flight now. Ciao! Well, the image, whatever it is, is dark. The range of shades goes from black to grey, mostly grey, with no purely white areas. It’s definitely not overexposed and since there’s not a nice distribution of pixels across the entire histogram, I’d say it’s not well exposed either. Underexposed is my slightly educated guess. Hope you had a good flight. Something in the picture is solid black. Not a lot, but my guess is that the object the photographer is shooting, is mostly black.